CM Magazine: The Lickety-Split Princess. Regina, SK: Couteau Books, 2001. Megan sighed. "You mean, even Barky's gonna be famous?" As they turned to walk back through the orchard, Dagny tripped over one of the boards hidden in the long grass, and sprawled out flat. The bald-headed dandelions went flying everywhere. "Are you okay?" asked Megan. Dagny sat up, wrapped her arms around her knees, and suddenly burst into tears. Megan knelt down beside her. "Did you get a broken leg?" Dagny shook her head. "The smell of Fantasy didn't work. Nothing works. That's how come I'm crying." She choked out the words, gulping big breaths. "Chris won third prize in Rosie Fryback's Original Fairy Tale Contest and I couldn't even think up an ending. My imagination is gone...gone...gone!" There's a new book out that reveals novel ways to overcome writer's block. But authors be warned; it's not what you think. 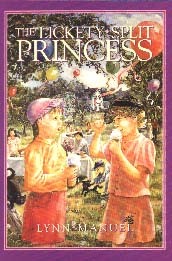 The book is called The Lickety-Split Princess, and the methods are unconventional, at best. In the book, Dagny Comfort and Megan Canary (from the best-selling The Cherry-Pit Princess) are best friends on an urgent quest to get Dagny's famed imagination back. They need it desperately for the girls have less than a week to win a contest for the best ending to a local author's original fairytale, get their pictures in the newspaper, and become famous. Even worse, the loss of Dagny's imagination is the first sign that the all-seeing Great Dictionary is right about her future: Dagny is doomed to a life of obscure drudgery, a fate far removed from her dreams of becoming a famous author. Author Lynn Manuel tells an exuberant story. It bursts with perpetual motion, the same kind that possesses kids and leaves their parents gasping for breath. The kids in her story are incapable of merely moving; they stomp, they take flying leaps off steps, they whip open dictionaries. Even sitting they're in motion: eyebrows wiggling, noses wrinkling, and mouths especially, mouths always working. The words that Manuel puts into these mouths are the best evidence of her ability to capture the essence of childhood. Her kids talk at breakneck speed and make liberal use of superlatives and exaggeration. They boast and say exactly what they think with an undiluted openness. Their speech incorporates some comical adult expressions as well, incongruities like "Yes sirree, Bob! ", "the nerve!" and "It stinks to high heaven!" Even outside of dialogue, Manuel uses words as children do--without stopping to search for just the right word, creating instead whatever fits the bill: zigzaggy, bendy, foggle-boggled, wiggly-wobbly. Readers will revel in this wordplay and in the many takes on the "not exactly, but almost" exchanges at the end of each chapter. It comes as no surprise, then, that Manuel displays an amazing grasp of the juvenile thought process. Dagny and Megan like to categorize, for example: the girls are best friends, but Chris is their best friend who's a boy. These alliances can shift in an instant, but forgiveness is both wholehearted and instantaneous. The children are well aware that the world plays by rules, but their grasp of the rules is tenuous. Are you allowed to put spit, stinky feet and manure into poems? Being famous, of course, is of huge importance, as is ice cream. A testament to the stature of ice cream, references to the confection are scattered throughout the book. Finally, Manuel's grasp of a child's logic is amazing. Kids don't get stuck for long, seeking solutions based on what they know for scientific fact. That moon rocks can counteract the effects of gravity is ridiculous, to be sure, but the logic applied by the children to reach that conclusion is admirable, and, admittedly, quite sensible. The moon rocks, by the way, bring us back to where we started, with ways to remove writer's block. Yes, the methods are most certainly bizarre. But hidden amongst the hilarity are indeed some words of wisdom, and they are applicable to writers of all ages.